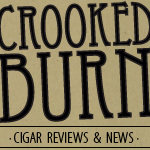 This week I'm starting something new at the Crooked Burn cigar blog. Recently, I was at New Havana Cigars visiting owner Dan Welsh (NHCDAN on Twitter) and checking out the new stock of El Triunfadors by Pete Johnson. Dan and I got to talking about different vitolas and we both agreed that, when we first started smoking cigars, we'd try only one vitola of a cigar release and base our opinion of the whole line on that one size. Well, most seasoned cigar smokers and cigar manufacturers will say that you can sometimes get drastically different flavors and profiles from the different vitolas within the same line of cigars. We were willing to test that theory, so Dan set me up with his line sampler of the new El Triunfadors and, in the next few weeks, I'm going to smoke and review every one of them to find out whether or not I detect big differences between the vitolas. Sounds like fun, doesn't it? Just last week, I smoked a new El Triunfador as a test run and, after that experience, I know this line sampler review is going to be a treat. "A medium bodied blend that gets a ton of flavor from the Seco leaves originating on Pepin's La Estrella farm in Esteli, it features an Ecuadorian Habano wrapper and Nicaraguan filler and is available in 6 sizes, including a lancero. (Not to be confused with the original lancero, which is still being produced with it's dark Broadleaf wrapper.)"